TORONTO, ON--(Marketwired - December 11, 2013) - Signature Vacations is excited to announce its Plane Spotting with RIU Facebook Contest where two all inclusive vacations for two to popular RIU Hotels & Resorts properties are up for grabs. For two weeks, each day from now until December 24, Signature Vacations will post an image of the beautifully RIU branded plane in various sun destinations. Participants simply have to "like" the Signature Vacations Facebook page and each day during the contest they can guess which destination corresponds with the plane to earn an entry for a chance to win an all inclusive vacation for two to the new adults only Riu Palace Jamaica or the Riu Santa Fe in Los Cabos, Mexico. At the end of the contest Signature will hold a draw to select the two winners. 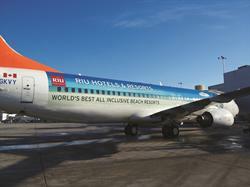 Signature's exclusive partner, RIU Hotels & Resorts has been prominently displayed on the fuselage of one of Sunwing's 737-800 fleet. Signature and RIU are both very proud of the plane as it symbolizes the strong, exclusive partnership between Signature and RIU and also provides customers an exciting and unique experience as part of their overall vacation. Located just 20 minutes from downtown Montego Bay, the new adults only Riu Palace Jamaica is a tropical sanctuary ideal for spending intimate moments under the sun. Riu Palace Jamaica's signature drink at the Aqua Bar is called, Lightning Bolt -- a tasty concoction combines delicious Jamaica Appleton white rum with lime juice, syrup, lemonade, and melon liqueur. This beverage was named after the speed-defying Jamaican native, Usain Bolt. All Signature guests visiting the Riu Palace Jamaica will receive special Riu Palace Adults Only by RIU inclusions such as a welcome glass of sparkling wine, free WiFi throughout the hotel, concierge service, in room bathrobes, and unlimited premium drinks throughout the hotel. For an additional charge guests will enjoy a special upgraded wine menu and a romantic dinner on the beach. The Riu Santa Fe in lovely Los Cabos, Mexico is an alluring, popular destination for tourists. With a charming, rustic Santa Fe atmosphere, this resort offers 24-hour room service, all-day meals and snacks, and a front desk that is open around the clock. Guests can access the fully-equipped fitness centre, play a round of golf or rejuvenate with first-class luxury spa treatments. Indulge in international and local delights at any of the specialty restaurants or sip margaritas at the pool bar. Signature guests also receive special RIU-Topia inclusions such as complimentary WiFi, a welcome cocktail upon arrival, in-room liquor dispensers, regularly restocked in-room mini-bar, discounts on select excursions, a credit to use towards spa services, and more. All Signature Vacations packages are aboard Sunwing Airlines offering convenient, direct flights to Jamaica from 13 Canadian cities and direct flights to Los Cabos from 10 Canadian Cities. For more information visit www.signature.ca. To book, contact your travel agent. All Signature Vacations packages include "Sunwing Airlines' Award Winning Champagne Service," which features a complimentary glass of champagne, hot towel service, Hot & Fresh Bistro meals served with a choice of wine at lunch and dinner, and complimentary inflight entertainment, including first run movies and a generous free 20kg baggage allowance. For just $40 more per flight segment, travellers can upgrade to Sunwing's Elite Plus service, which features advance seat selection, separate check-in at a majority of airports, advance boarding, 30 kg baggage allowance, priority baggage handling and extra legroom seats.